I think I “have” Asperger’s disorder. The “have” is in quotes because I’m not certain what it means to “have” it. If you have pneumonia, you just have it. There are bacteria in your lungs which are detectable and eradicable. You can go from having it to not having it to having it again, and each condition is discrete – that is, you can tell having it from not having it not only by the judgment of a medical doctor but by physical signs. Bacterial load, for example, can be objectively verified. “Having” Asperger’s is a different matter. The doctor can check certain signs and symptoms but none of them are terribly objective. I always come up positive on self-scores, for example, because I think I should and know how to answer the questions to make it happen. Psychiatrists and psychologists will always have some bias as they do their work and will not rely on instruments alone even if they were free from subjectivity. My psychotherapist declined to even entertain the notion that I might “have” Aspergers. She said I might have “had” it in childhood but was most likely recovered, and that exploring the idea any further would most likely not help me in my journey forward. I love her for this, for refusing to label or categorize me, and yet I can’t escape the idea that when people are describing this disorder they are describing me. I have some pretty obvious social deficits. They don’t keep me from being employed, from being married, from completing school, or from having friends. They do keep me from being secure in public and from having loads of job offers and from having a lot of friends. My particular weaknesses are saying hello an goodbye; I prefer to arrive unnoticed and leave the same way rather than navigate the banal hassle of the small-talk ritual, which I can grasp intellectually but have never really mastered. I also have trouble with doorways, especially glass doors. I can see other people coming and don’t quite know how to get through the door without offending anyone. Should I hold it for the person behind me who is not quite close enough to catch it yet? Should I open it for the person in front and then go through, or go through and hold it? Or pretend everyone else doesn’t exist and just push through? Other people seem to handle these situations with relative ease but they bind me up. I think about them later as I’m driving around. They bother me. And novelty upsets me. I can find my way through the Denver airport because I’ve done it a lot now. But at new airports, I always turn the wrong way, go to the wrong place. When building things from paper directions, I always invert the thing I’m building somehow and need to take it apart and start over – every single time. In fitness classes, I am constantly doing exactly the reverse of the instructor – going left when I should go right. Is it merely neuroticism? I tend to think not. But all this worry over small, unimportant social matters leads to a big epistemic question about diagnosis. Let’s assume for a second that I’m right, and that I “have” Asperger’s disorder. Do I experience these social deficits because I have it, or do I have it because I experience these deficits? When the DSM IV TR was first published, it arrived on the scene with the second assumption foremost in its epistemology. It is a classification manual, by which we can group observations into categories. People who have trouble learning social skills by observation as well as certain other patterns of deficits we group under the heading “Asperger’s disorder.” They have the disorder because they have the patterns of deficits. The manual makes no claims about the underlying etiology of the disorder. It could be biological, sociological or psychological in origin and meet the criteria equally well. It could be curable or incurable. So might brain might be working differently. I might just be confused because I’m bi-cultural – I grew up in a foreign country. Or my upbringing or personal circumstances might have lead me to over-identify with my intellect and neglect social interactions. In any case, were I to meet the criteria for this disorder, I would “have” it. Having it in this way might not be terribly confining. I could meet the criteria today and grow out of them tomorrow. In fact, I suspect I’ve learned enough of how to get by that a sane psychologist would have a hard time saying I experience enough dysfunction to have Asperger’s. But there is another way to have it. We could make an alternate assumption: that a disease process results in the noted deficits. 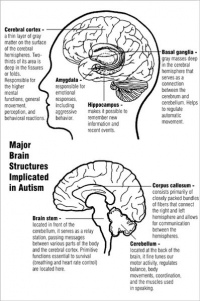 People with Asperger’s tend to have types of behavior in common. Might they also have types of neurological differences in common? Could my lack of social grace result from missing or inadequate mirror neurons? Or from a brain that grew too rapidly in childhood, resulting in less than average connectivity between brain regions? When we begin making these sorts of assumptions, we derive some explanatory power about the condition in which the person finds their self. I might be comforted to know the bullying I received as a child is a result of a physical condition that made me behave differently rather than of choiceful behavior on my part. I’d be a sick person rather than a bad person. And when I approach a door with some trepidation, it would be because of my mirror neurons, not because of my personality. While there is comfort in this, it is easy to confuse fault and responsibility. It might not be my fault that I’ve always acted a bit strangely. It is, however, my responsibility, because nobody can change my behavior but me. And nobody but me has to live inside my head. When we presume medical causes for behavioral disorders, we also begin to presume the responsibilities for these outcomes lie with the provider of treatment rather than with the person. Biology becomes destiny. Expectations decline. Even my own expectations for myself might do so, and I suspect this is part of the reason my therapist declined to discuss this subject. You see, if I am strange because of my Asperger’s, then I always will be. I can just start introducing myself that way and ask others to make allowances for my disabling condition, rather than seeking to grow beyond my programming, to transcend my initial conditions. I might begin to not just have Asperger’s but to be it. As we progress towards the newest version of the DSM, some of these assumptions are going to be more in evidence. A bio-medical model is going to be more obviously underlying the classification system. How much will such an orientation take away the freedom of people who are suffering to suffer in their own way and to be responsible for their own recovery? How much will biology become destiny? How much will doctors dispense treatment rather than patients transcend their condition? I prefer to continue to “have” Asperger’s disorder than to be it.